Following screening, genetic testing can occur during pregnancy for Down syndrome, Trisomy 18, and other conditions. Two major types of genetic testing are available: amniocentesis and chorionic villus sampling; however, these tests can increase the risk of miscarriage. New non-invasive prenatal screening can now be conducted on a mother’s blood samples. These tests analyze trace amounts of the baby’s genetic information (DNA) that is present in the mother’s blood. These tests are more reliable than the other tests, have a higher detection rate (e.g., 99% for Down syndrome), and can be carried out early in pregnancy (after 10 weeks). 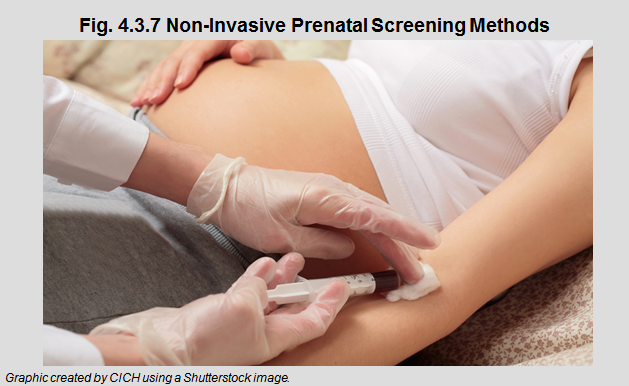 The use of non-invasive prenatal screening varies from province to province. It is available privately (paid for by the patient) in British Columbia,1 Manitoba, and Ontario2 as an alternative to amniocentesis. Patients in Quebec can access these tests through private labs. Non-invasive prenatal screening is currently not insured in Canada; however, it is available privately to those people who have the means to pay. The decisions that families face regarding genetic screening are complex. If a fetus could inherit a serious health problem, the decisions facing the mother and family can be difficult. Access to appropriate counselling and support during these times is essential. To help women and families understand the implications, informed consent is an important component of the medical decision process.